Colleen, one of our Angels on the Soldiers' Angels Angel Bakers Team created these sweet treats for one of the soldiers she supports in Pakistan. Colleen and her granddaughter baked and sent these delicious looking cake mix cookies, as well as sugar cookies, S'mores, and Somoa cookies! "Thank you soooooo much for the care package (I picked it up today). I have laid out the cookies and all the guys have already dug into them - they are almost gone. Please tell your granddaughter thanks for taking the time to help bake us the goodies. I am really excited about the book Blossom Street Brides by Debbie Macomber. I am a huge fan of the cedar cove series on Hallmark. Again, a heartfelt THANK YOU... Your care package meant a great deal." Do you love to bake? 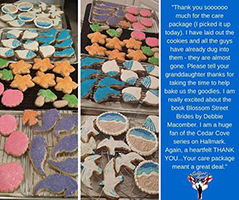 To learn more about the Soldiers' Angels Angel Bakers Team and how you can be a part of sending sweet treats like these to our deployed troops, click here.